Saturday I was in a bit of a quandary. I had all of the fixings for pizza, including tomato sauce that really needed to be used sooner rather than later, but I haven't made pasta in a while and I really wanted pasta. So why not use all of those pizza fixings with pasta? I couldn't think of any reason why it wouldn't work, so pasta won. I whipped up a batch and got to work on the sauce. I chopped up garlic and onions and sauteed them in olive oil. Then I added a tablespoon of tomato paste from the freezer (once I open a can, if I'm not going to use it all I divide it up by the tablespoon and freeze the individual portions on a sheet of wax paper. Once they're frozen I cut up the wax paper, wrap it around each piece, and throw it all into a freezer bag so I can use it in the amounts that I want. I used to just use the whole can regardless of what the recipe stated, but when I was on a budget I got in the habit of doing this and it sure comes in handy. Wow - this parenthetical aside is actually longer than this paragraph is going to be!) and let it melt and start to brown in the pan. Once the tomato paste was browned and the onions and garlic were soft, I added the tomato sauce and my pizza spices - two parts dried thyme and oregano to one part dried thyme. I add just a little bit of salt because I was planning to add green olives and I didn't want it to be too salty. I added a little water to thin out the sauce and lowered the heat to a simmer while I cut up some frozen artichoke hearts and the olives. I added those when the sauce had simmered for a while and was ready. 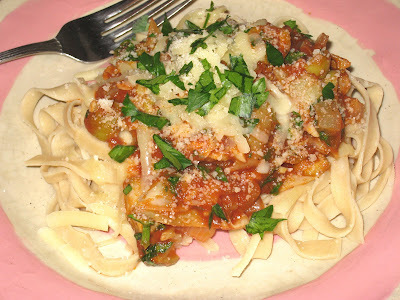 The artichoke hearts were still a little frozen so they thinned out the sauce some. Overall, the dish was a success, which is not really a surprise considering the ingredients. What was a surprise was how well the pasta worked. I have been trying to re-incorporate more whole wheat into my life, and I decided that this was the time for me to start incorporating it into my pasta. I started with one-third white whole wheat to two-thirds all-purpose flour. White whole wheat comes from a different kind of wheat than the kind of whole wheat flour I am used to using, which comes from a red wheat. The white whole wheat is more delicate than the red whole wheat and the bran isn't as noticeable, so it doesn't break the structure of the gluten as much. It works more like all-purpose flour but it is sturdier. And I have to say that I liked the flavor of the pasta with the white whole wheat more than the pasta made only with the all-purpose flour. I was afraid it would be harder to roll out, but it was about the same. Surprisingly, it was easier to cut and unroll than the all-purpose pasta was. I have also started making all of my pasta in the food processor. It's faster and easier to clean up than mounding up the flour, making the well, dropping in the eggs and salt and mixing it up on the counter. Don't get me wrong - I'm glad I know how to do it and it helped me to get familiar with how the dough should feel, but it's a little easier on the shoulders and elbows to do the initial work in the processor. All in all, a rousing success. I plan to keep raising the ratio of white whole wheat to all-purpose flour, but if you are just getting started and want to take it slowly like I did, here is how you start. Place the white whole wheat flour and 1/2 a cup of the all-purpose flour in the bowl of a food processor. Add the salt and pulse a few times to mix the ingredients together. Add the eggs and pulse a few times, until the dough starts to come together. At this point it should still be sticky. Add the rest of the flour, about a third at a time, stopping when the dough is still tacky to the touch. Empty the dough onto a floured work surface. Knead until smooth and elastic, about ten minutes. Wrap in plastic and let rest for 20-30 minutes. Roll out the pasta until it is about 1/16-inch thick. Cut it into the desired shape (instructions for cutting into noodles here) and cook it in salted boiling water for 3 minutes. You can either add it to the pan with the sauce, or put the sauce on after it is plated. Or, if you want to cook the cut pasta later, make sure it is well coated with flour and put it in a plastic bag, where you can store it in the refrigerator for a day or two or the freezer for a few months.